My card for the current sketch at Match the Sketch came together with no stamping at all! 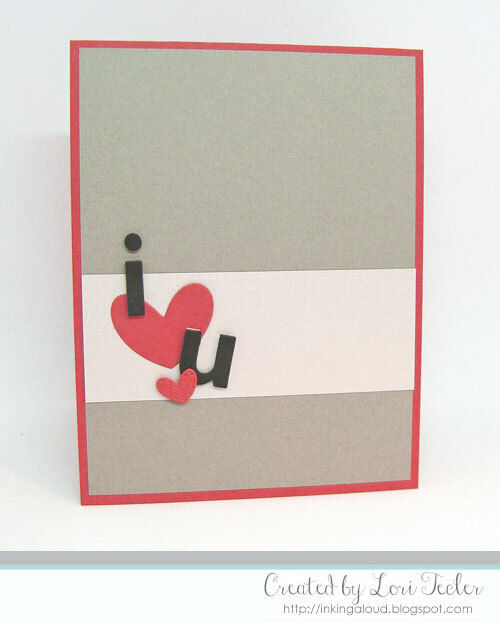 I represented the layout's circles with a combination of letters and hearts, all cut with dies from Clear and Simple Stamps. The "i" and "u" were cut from black cardstock. I paired them with two sizes of hearts cut from a scrap of red cardstock. All of the pieces were arranged on a strip of shimmery silver cardstock, using foam tape on most of the pieces to give them dimension. I adhered the silver strip to a gray cardstock panel, then adhered the panel to a red card base to match the die cut hearts. Simple, but it gets the message across! So sweet but clean and simple!